General Hospital (GH) spoilers reveal that one soap star is speaking out against her former employer. Sarah Joy Brown, who originated the role of Carly on GH, recently used Twitter to voice her complaints. She wants everyone to know what she’s been up against as she pushes for change. 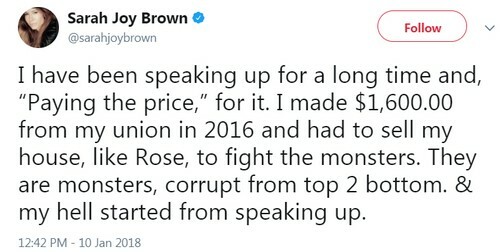 “I know that a lot of people and corporations in Hollywood are nervous, right now, hoping I’m going to forget what’s been done to me and mine,” Brown said. “No chance of that happening. No chance. I’m coming for them.” Later, Brown called out General Hospital specifically. She explained the gender wage gap she experienced during her time on the ABC soap. Brown noted that she worked with Steve Burton (Jason) and Maurice Benard (Sonny) for many years, but she was paid less than half their salaries. She won three Daytime Emmys for her performance on General Hospital, but the show refused to match her pay with Burton and Benard’s. All of them were hired at GH in the early to mid-90s, but Brown’s earnings never measured up to her costars. Another GH watcher thanked Brown for her honesty and pushed for a new perspective at the ABC soap. “I hope this changes,” she said. “And it helps to know.” Some viewers also criticized how GH tends to write some of its female characters. General Hospital spoilers say some big stories are coming up for GH’s women, so let’s hope the show portrays them as strong and savvy in the months ahead. What do you think about Sarah Joy Brown’s Twitter revelations? For those of you who can’t see the significance of her mentioning Steve Burton and Maurice Benard by name, realize that her tweet implicitly accuses them of compliance and complaisance with a system she calls corrupt. Are you behind her on this? We’ll give you updates as other GH news comes in. Stay tuned to the ABC soap and don’t forget to check CDL often for the latest General Hospital spoilers, updates and news.